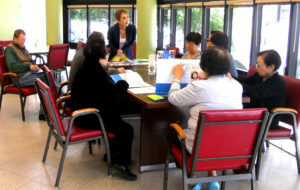 5/17 – A state outreach specialist engages with Korean-speaking residents of Steel Plaza Apartments in downtown Los Angeles. 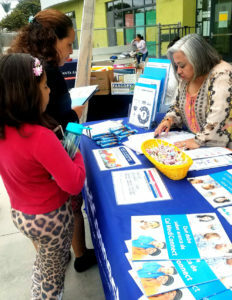 5/19 – State outreach staff share information with beneficiaries and caregivers at the Magnolia Science Center in Santa Ana. 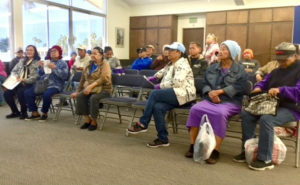 5/3 – Members of the Latino Senior Group at Parkview Hospital Medical Center in Riverside learn about Cal MediConnect. 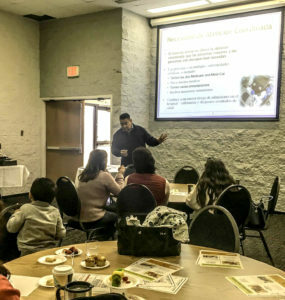 5/1 – Faith-based providers, beneficiaries, and caregivers learn about the CCI during a presentation at Paradise Valley Seventh Day Adventist Community Church in National City. 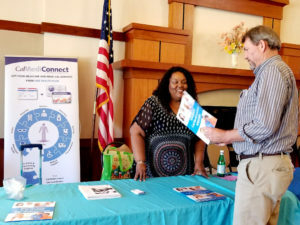 5/22 – A state outreach specialist staffs a resource table during the annual Mountain View Senior Resource Fair.